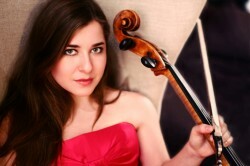 Cellist Alisa Weilerstein was today named a 2011 MacArthur Foundation Fellow. The prestigious award carries a prize of $500,000 of "no strings attached" support over the next five years and has been dubbed the "Genius Award". In a letter advising her of the honor, the MacArthur Foundation outlined that the fellowships are given in recognition of the recipient's "originality, creativity, self-direction, and capacity to contribute importantly to society through your work." New York-based Ms. Weilerstein, 29, was performing in Jerusalem when she received the news about being made a MacArthur Fellow: "This is an incredible and unexpected honor and completely overwhelming. My first response was an expression of total shock and amazement and I still cannot believe it." Ms. Weilerstein has attracted widespread attention worldwide for playing that combines a natural virtuosic command and technical precision with impassioned musicianship. She has appeared with all of the major orchestras throughout the United States and Europe and last year she became an exclusive recording artist for Decca Classics, the first cellist to be signed by the prestigious label in over 30 years. A major milestone in Ms. Weilerstein's career took place in May 2010 when she performed Elgar's Cello Concerto with the Berliner Philharmoniker and Daniel Barenboim in Oxford, England for the orchestra's 2010 European Concert. This concert was televised live to an audience of millions worldwide and also released on DVD by EuroArts (distributed by Naxos in the US). This performance followed her Berliner Philharmoniker debut with Mr. Barenboim days earlier. Ms. Weilerstein will record this concerto with Daniel Barenboim and the Berlin Staatskapelle in April 2012, pairing this work with Elliott Carter's Cello Concerto, for her debut Decca Classics release. In 2009, Ms. Weilerstein was one of four artists invited by the First Lady, Michelle Obama, to participate in a high profile classical music event at the White House that included student workshops hosted by the First Lady, and playing for guests including President Obama and the First Family. A month later she was the soloist on a tour of Venezuela with the Simón Bolívar Symphony Orchestra, led by Gustavo Dudamel. She has subsequently made numerous return visits to Venezuela to teach and perform with the orchestra as part of its famed El Sistema program of music education. In August 2010 she made her BBC Proms debut with the Minnesota Orchestra and Osmo Vänskä performing Shostakovich's Cello Concerto No. 1. She subsequently performed this work on a 15-city U.S. tour with the St. Petersburg Philharmonic led by Yuri Temirkanov and Nikolai Alexeev in 2011 that included the country's major concert venues such as Walt Disney Concert Hall, Davies Symphony Hall, Boston's Symphony Hall, Chicago's Orchestra Hall and Carnegie Hall, cementing her reputation as an impassioned and insightful interpreter of this work. Ms. Weilerstein begins her 2011-12 performance season with performances with the Baltimore Symphony this week of Dvorák's Cello Concerto led by 2005 MacArthur Foundation Fellow, Marin Alsop. Her season continues with return engagements with the Cleveland Orchestra, the Minnesota and Toronto Symphony Orchestras, the Los Angeles and New York Philharmonics, and the Hamburg Philharmonic. In November and December 2011 she will tour Australia, appearing with the Melbourne, West Australian and Sydney Symphonies with conductors Tadaaki Otaka (Tchaikovsky's "Rococo" Variations), Paul Daniel (Shostakovich's Cello Concerto No. 1) and Osmo Vänskä (Prokofiev's Cello Concerto) respectively. During this tour period she will make her debut with the Seoul Philharmonic in Korea. In May 2012 she will make her debut with the Philharmonia Orchestra in London performing the Dvorák Cello Concerto with Juraj Valchau. She will also undertake an eight-city recital tour of Europe with pianist Inon Barnatan. This season Ms. Weilerstein has also been appointed the Frankfurt Radio Symphony Orchestra's Artist in Residence. In November 2008 Ms. Weilerstein, who was diagnosed with type 1 diabetes when she was nine, became a Celebrity Advocate for the Juvenile Diabetes Research Foundation. For more information on Ms. Weilerstein including her full biography, performance calendar and photos, please visit her fan page on Facebook.